The Combat Application Tourniquet (C-A-T®) Generation 7 When we began work on the C-A-T® GEN 7 we considered every element that defines a tourniquet designed for combat use. We challenged ourselves to find the best, most forward-looking way possible to enhance performance and maximize application success. But we didn’t do this alone. Leveraging input from after action reviews, researchers, material scientists and you, the end-user, we were able to create the most advanced C-A-T® to date. Every component of the C-A-T® GEN 7 is optimized for performance and reliability. 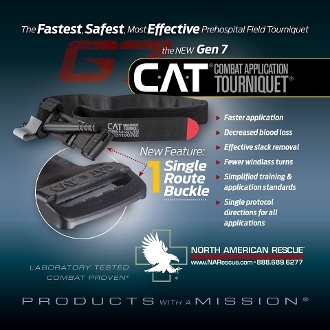 The C-A-T® GEN 7 has a single routing buckle system that (1) allows for extremely fast application and effective slack removal (2) unifies training standards and eliminates confusion by having a single protocol/directions for all applications. Unified training standards with single protocol/directions for all applications.